There was a time when the Google Play Store was lacking in content. The only benefit was that it was easy to find the handful of great apps on the platform. Now there are many, many apps, and quite a few of them are good. Now the best way to find them is to check our Google Play App Roundup. Every week we bring you the best new, and newly updated app in the store. Just click the links to head right to the Google Play Store and download everything for yourself. All your standard browsers work in more or less the same way, but what if that way isn't ideal for mobile? Cake is a new browser that claims to be designed with mobile in mind. In some ways it's like a "regular" browser, but search is all swipeable. You just page through results instead of using the regular search page, which could be a real time saver. When launched, Cake offers a text entry field where you can input a URL or search term. Should you want to search, Cake offers trending results right below the field. After you search, the first result (via your choice of Google or Bing) loads in a new tab. Swipe to the right, and you get the next search result. These pages are already loaded, so there's no waiting as you move from one to the next. Cake loads the top ten results in this swipeable interface. If one of these is the page you want, you can begin scrolling up and down as you normally would. In the event one of the top ten results isn't right, you can go back to the first page and swipe to the left. That's where the standard search results page lives. In my testing, I've found the swipeable UI to be good for basic searches. If you're looking for a very specific page, it's easier to look at the regular results and tap the link you want. 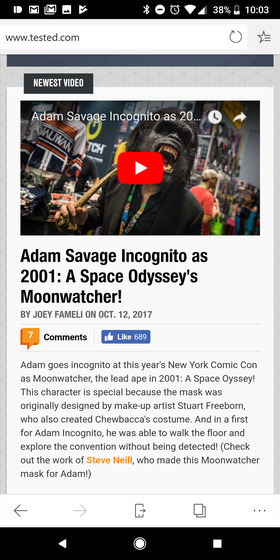 There's a persistent bar at the bottom of the screen with quick access to features like bookmarks and tabs, but there's also a big search button right in the middle. That brings up search categories like videos and images, so these more specific searches work with the swipeable interface. When you're looking a regular web page, Cake works like most browsers. You can add bookmarks, open links in new tabs, and so on. There's also built-in ad-blocking. One thing I will note, the overall experience is a bit sluggish. This is most noticeable when you're in the search interface, which I assume has something to do with loading all those results at the same time. However, even a single page has a touch of lag when scrolling. If the developers can optimize a little more, Cake could be a cool alternative to Chrome or Firefox. A new week has dawned, and with it comes a new list of great things happening on Android. This is the Google Play App Roundup where we tell you what needs to be on your phone or tablet right now. Just click the links to head to Google Play and grab these apps for yourself. In this go-go digital world of ours, you're probably getting news and social content from multiple sources. It can be tedious to go to different apps and websites to make that happen, but Feedster might be the answer. It has a lot in common with a regular feed reader app, but it plugs into more sources and has a clean interface. Feedster starts by asking you to log into your account on services like Twitter, Reddit, Instagram, and Feedly. It pulls all that content in and turns it into a single feed. The feed is organized by some process that I cannot discern. It's not chronological, so it's probably some mix of popularity and timeliness. By default, it only shows you content you have not seen before, but you can change that in settings. Each item in your feed tells you what service spawned it right at the top. You can tap on any of them to get an expanded view of the content, which varies based on what it is. Instagram posts load the full image and comments, by a news story from Reddit or Feedly loads the URL in a Chrome Custom Tab. You can always swipe to the right to get back to the main feed. There's also a floating button at the top of the screen to zip you back up to the top for quick refreshing. In general, I'm very impressed with how well Feedster handles content from all these sources. You can actually interact with the content like you would in a native app. For example, you can view comments and up/downvote on Reddit posts. For Twitter, you can see the full conversation, reply, retweet, or like a post. In the free version of the app, you get a light and dark theme. The paid version adds a number of other themes, though. The upgrade also removes the ads interspersed with your content. They aren't too annoying, but the upgrade is only $2.99. You probably already use your phone to make reminders, but how often are those reminders related to sending a message? Ask someone about something or wish that guy a happy whatever—you know the drill. Scheduled is an app that takes the middleman out and lets you schedule messages for the future. Scheduled works with a wide variety of messaging apps and services like WhatsApp, Facebook Messenger, and Telegram. There's also support for good old-fashioned SMS. In fact, SMS is the most powerful option in Scheduled. When setting up an SMS, you can choose to have the app send the message automatically when you configure it. To set up a message, simply pick a contact, date, time, and repetition. 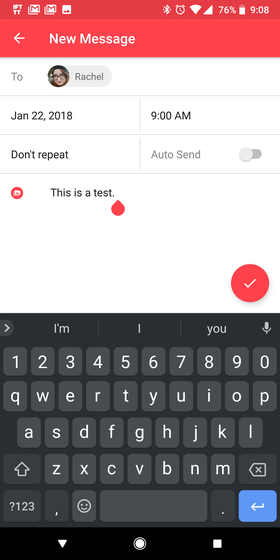 Toggle on the auto-send feature if you're sending an SMS and you want to speed things along. The app fires off a notification at the appointed hour, allowing you to quickly open up the message details. A tap on the send button brings up menu of supported apps. Tap the one you want to use, and the message is dropped in. Again, SMS is the coolest part of the app as Scheduled can simply act as the SMS sender. That's a single tap to send, or no taps if you choose to send automatically. You can schedule as many messages as you want in the app, and there's even an option to sync the birthdays in your calendar for easy messaging of happy birthday wishes. The basic functionality is free, but you might be wondering why the app's reviews in the Play Store are a bit mixed. Well, people aren't jazzed about the payment model. The app has some ads, and the auto-sending feature is locked unless you pay. Oddly, the developer has opted for a subscription model. It's $0.99 per month for the premium features. A lot of people will probably steer clear for that reason, but if you use this app frequently, I can see the $12 annual cost making some sense. A new week has dawned, and with it comes a new list of great things happening on Android. This is the Google Play App Roundup where we tell you what needs to be on your phone right now. Just click the links to head to Google Play and grab these apps for yourself. Your privacy on the internet used to be assumed, but we live in a much more complicated world these days. Your ISP sees all your unencrypted traffic, and the only way to prevent that is to stick a VPN between you and the ISP. However, you need to actually trust that VPN. The makers of ProtonMail have released an Android VPN client, and plenty of people already trust the ProtonMail developers, who came from CERN and MIT. The app happens to be pretty solid, too. ProtonVPN can be used completely free, but there are paid plans that include faster connectivity and more features. Regardless of your plan type, you still get access to Proton's secure servers. The app plugs into Android's built-in VPN system, so all you need to do is log in and tap the dialogs to allow access. The app's main interface is broken up into three tabs. There's countries, map view, and profiles. The countries tab just lists all the places where servers are available. Each one is a collapsible list with the individual servers listed. Each one has a capacity indicator so you can choose a good one. However, most of the time it's easier just to tap the action button at the bottom of the screen and select the "fastest" option. The exception is, of course, when you need to connect to a certain country. The map view tab lets you connect to the country of your choice in a single tap. The profile tab is basically a list of your favorite servers. There are stock options for fastest and random, but you can create new ones with servers of your choice. Across all three tabs is a popup menu at the bottom of the display. You can slide that up to see your current connection stats. There's IP, server, a traffic graph, and so on. There's also a disconnect button and an option to save the server as a profile. ProtonVPN has several service tiers. The free level only offers access to three of 12 countries and just low speeds (no P2P). It's single-device, too. You get higher speeds and 2 devices for $4 per month, and five devices runs you $8 per month. When you sign up for a new account, there's a trial of the faster speeds, but the app doesn't say how long it lasts. I'd assume a week or so. It's plenty fast for just about anything you could want to do on your phone. ProtonVPN says its servers are all 1-10Gbps, so even desktop usage should be fine. This seems like a genuinely compelling VPN option for Android users now that there's a native app. At $4 per month, you can get ProtonVPN protecting your computer and phone. That's cheaper than a lot of other services. You probably want more apps, but more than that, you want the right ones. That's what we're here to deliver with the weekly Google Play App Roundup. This is where you'll find the best new and newly updated apps and games on Android. Just click the link to head right to Google Play. Cloud storage services are a dime a dozen lately, but storage monolith Western Digital is looking to get into this space by charging less than a dime. Its UpThere cloud storage service costs just $1.99 per month for 100GB of space, which is the same as many competing services. However, there's more flexibility here. There's even a new Android app to use, and it's pretty good. Like other cloud storage apps, Western Digital wants you to import files from your phone as you create them. One of the first things suggested by UpThere is linking your gallery, which creates backups of all your photos on the UpThere servers. You can also designate other folders to back up to the cloud via UpThere. The app has a clean monochrome look with a bottom tab bar for navigation. Yes, that's an acceptable part of the material design guidelines these days. Although, I'm not sure about WD's decision to leave the buttons unlabeled. The far left tab is your "home screen" for UpThere, but it's called Flow. It's a sort of timeline where you can see all the activity on your account. In general, UpThere has fancy names for several basic concepts. The other tabs are for file types like images, documents, and music. In the case of music, you can use UpThere to stream your tracks at full quality. The last tab is for "Loops," which seem to just be folders by another name. You can add items to a Loop to see them all in one place. Loops also plug into UpThere's sharing system. You can still share files the old-fashioned way, but you can basically create shared Loops for other people to view as you add new things to them. You can try UpThere free for three months. After that, it's $1.99 per month for 100GB, but interestingly, that's the rate for every 100GB. If you need another 100GB, it's just another $1.99 per month. This looks like a much more flexible pricing model than something like Drive, which jumps from 100GB to 1TB. If you're not already married to a cloud storage service, you might want to give UpThere a shot. A new week has dawned, but you can ease the transition with some new apps and games. You've come to the right place, too. This is the Google Play App Roundup, the weekly feature where we tell you what's new and cool in Google Play. Just hit the links to zoom right to the Play Store. Many of us have spare Android phones around collecting dust, but a new app from The Guardian and Edward Snowden could give those devices a new lease on life. Haven lets you leverage all the sensors in your phone to monitor your personal space, and unlike cloud-connected security cameras, you're completely in control. Haven installs on any Android phone, using the microphone, cameras, and orientation sensors to detect changes. When you first open the app, it asks you to choose sensitivity levels for motion and sound. You can move the phone around and make noise to find a level that makes sense for your situation. For the camera, you can choose between front and rear. You'll probably need a stand or mount of some sort to keep the camera pointed at a door or whatever else. The camera on a smartphone (usually) isn't nearly as wide angle as a security camera. However, maybe you want Haven to be more surreptitious. You can just set the phone on a desk where it will capture anyone who sits down or moves the phone out of the way. Getting notifications is what makes haven truly interesting. 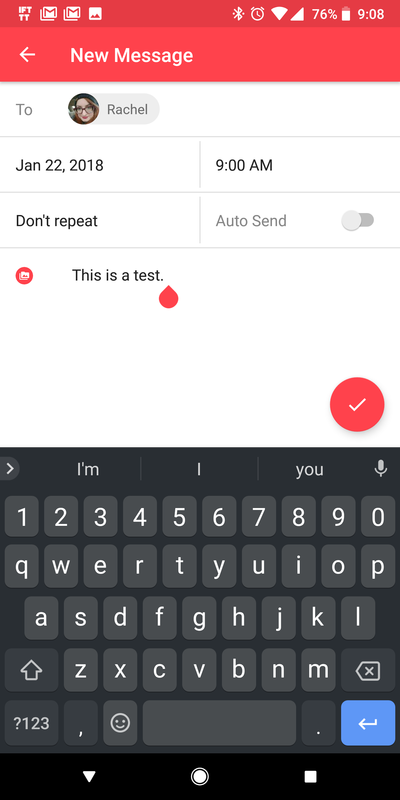 You can set up the app to send SMS alerts, but that's only good if you have a SIM card in it and don't mind the insecure nature of text messages, A more secure option is to set up a Signal profile on the phone. This encrypted messaging service lets you push messages via WiFi to devices without anyone eavesdropping. There's also a Tor hidden service upload, if you want to check on the camera like that. When you activate, Haven, you get a 30-second countdown before it's armed (this is configurable). I've set this app up on a few phones to test, and it seems very good at detecting sound and motion based on the calibration settings. The camera features work well enough, but there are a few bugs. Using the rear camera on some phones seems to produce a lot of alerts when nothing is actually moving. This doesn't happen as much when stationary objects are not close to the device. There's supposed to be an ambient light trigger as well, but I don't see it in the app. Haven is still in beta, so these small bugs will hopefully be worked out. It's free and could perform an important service. Thankfully, spell checking is now standard on most Android devices. However, spelling is only part of the problem. Grammar is much harder for computers to correct, and your phone mostly doesn't bother. Grammarly is a desktop tool that aims to improve all aspects of your writing. Now, it's available on Android as a keyboard app. Getting Grammarly up and running is the same as any other keyboard. Just enable it in the settings and switch your input method using the notification. 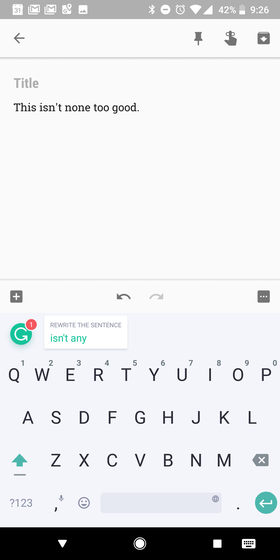 At first glance, Grammarly looks like the Google Keyboard, which I assume is not an accident. The basic functionality is mostly the same, but there's no swipe input. That's a real bummer for me, but not everyone uses it so heavily. As you start typing, that's where things get interesting. 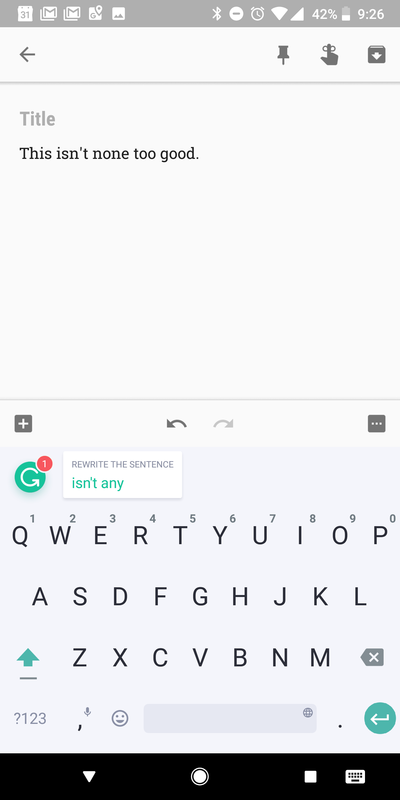 As a keyboard, Grammarly can see all of the text you add to a field. Thus, it can offer corrections based on its understanding of the English language. Potential revisions appear in the space directly above the keyboard where most apps have suggestions. These boxes might suggest you add, change, or remove a word. It can also catch various punctuation problems. Just tap the box, and Grammarly will make the change in your text. You'll be asked to log into the app when you set it up, but that's optional. However, you should consider doing so if you use Grammarly on other platforms. If you have a premium subscription, you definitely want to sign in. Premium users get access to the full suite of Grammarly corrections just like on the desktop. It can pick up on things like passive voice and sentence structure. The correction features seem mostly accurate to me, but machines still have problems with some elements of language. Grammarly is better than most, though. My only issue is with the keyboard part of the keyboard. It'd be nice to see more features like themes, swipe input, and additional layouts. I'm looking forward to seeing what we get in future updates. I don't know if you could say there are too many apps out there, but there are certainly enough that it can be hard to find the ones worth your time. This is the problem that Google Play App Roundup is seeking to solve. Every week we tell you about the best new and newly updated apps in the Play Store. Just click the app name to head right to the Play Store and check things out for yourself. Smartphones have allowed billions of people to access the whole of human knowledge at any moment, communicate openly in the blink of an eye, and avoid going to sleep as they stare at the warm glow of the internet in their hand. On that last count, screen brightness is a constant issue. Even when you think you've set a nice dark theme on your device, something bright can pop up and scorch your retinas. No more with Underburn. This app monitors the colors displayed on your screen and intelligently modifies the brightness to save your eyes from the light. To make this work, Underburn does need to ask for some rather serious permissions. It needs access to your system settings and the ability to record your screen. It'll ask for the screen permission every time you start it, though. It's not just going to start watching you in the background, and the developer removed the internet access permission to further put your mind at peace. The reason Underburn needs this sort of access is that it's actually taking a screenshot every quarter of a second. Those images are checked to see how many bright colors are displayed. When it seems the content getting brighter, Underburn lowers the brightness of your screen to compensate. I haven't noticed any performance impacts from running Underburn in the background, but you might want to watch carefully if your phone is already a bit slow. This could make it worse. This app makes the most sense when you're using a dark system UI or app theme. Then, whenever an image or message appears that's mostly white, the screen dims to save your eyes. I also find it very useful for checking the notifications, which are much lighter than most of the apps I'm using. Underburn takes a fraction of a second to adjust the brightness, and there's an optional floating button that can tweak the brightness setting. Before you activate Underburn, you can also change what the light and dark cutoffs are, as well as how much it will adjust the brightness in automatic mode. It does require a persistent notification, but that makes sense considering the nature of the app. 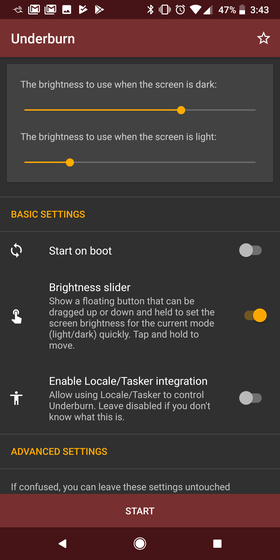 I also like that you can plug Underburn into Tasker for full automation. Underburn is $1.49 in the Play Store, but it solves a common problem. You might not even realize you had this problem until Underburn solves it for you. Your phone might be cool, but it could be a lot cooler with the right apps. So what? Spend like mad until you find the apps that suit your needs? Nah, just read the weekly Google Play App Roundup here on Tested. We strive to bring you the best new, and newly updated apps on Android. Just click the app name to head to the Play Store. Many smartphone users try to keep their bills lower by sticking with capped data plans from carriers or MVNOs like Project Fi. Making sure you don't use too much data can be a pain, though. Android has some built-in data tracking tools, but they're not very user-friendly. 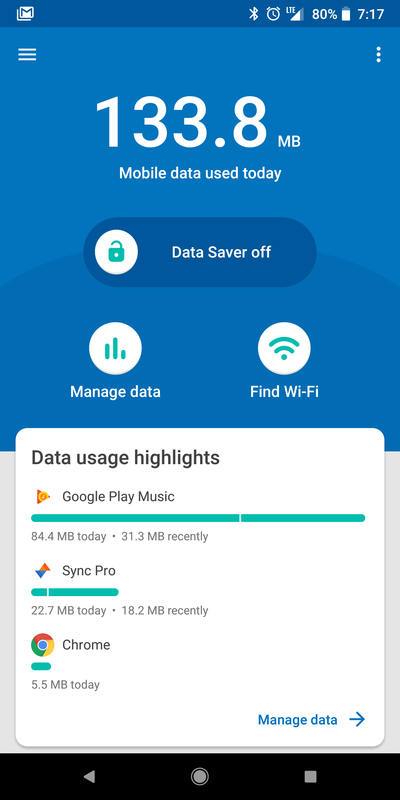 Google's latest app lets you exert more control over your data usage by plugging into these system features. The app is called Datally, and it's available on virtually all devices. 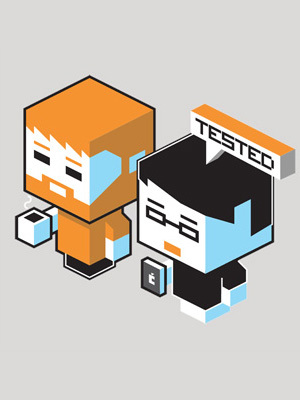 You might know Datally as Triangle, which was the name during Google's geo-limited testing period. Now the app is done and has a new name for its global rollout. Unlike most other data monitoring apps, Datally doesn't need to run for multiple days accumulating data before it's useful. It pulls in all the historic LTE usage info from your system-level features to help you figure out what's using the most data. Datally shows you how much cellular data has been used each day and by each app on your phone. Should your data usage get out of hand, Datally also includes a data saver feature. Again, this is similar to functionality already included in the settings of most phones, but it's implemented in a much clearer way. There are toggles throughout the app to turn on data saver, so Google seems to really want you to use it. This feature uses a VPN to control which apps can use data, but the app promises Google isn't examining your data. It's up to you to take Google at its word there. 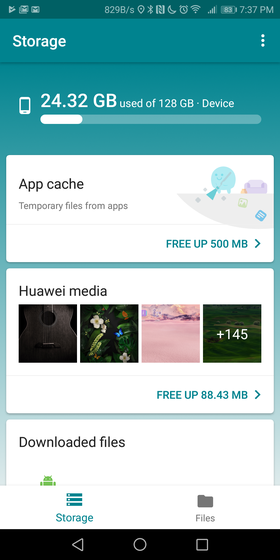 By default, no app can use data in the background when Data Saver is turned on. Only the apps you have up and are actively using can do that. In addition, there's a floating bubble on the screen to show you how much data the app has used in the current session. Data Saver is completely configurable as well. If you want an app to have unrestricted background access in Data Saver, you can unlock it in the app. You can also completely disable cellular data in an app even if you open it. That's handy for apps that you know use a lot of data and you might open without realizing you're on cell data. Datally also offers a list of local WiFi hotspots if you need to get a lot of downloading done while you're out. This list includes shortcuts to Maps so you can get directions. This is a great app, and one that could actually save you money if you're on a limited or pre-paid data plan. Your phone or tablet might be cool, but it could be a lot cooler with the right apps. So what? Spend like mad until you find the apps that suit your needs? Nah, just read the weekly Google Play App Roundup here on Tested. We strive to bring you the best new, and newly updated apps on Android. Just click the app name to head to the Play Store. All phones come with a gallery app of some sort, but they're often clunky and overflowing with features you don't want. Focus has long been one of my favorite replacement gallery apps, and now there's a faster, simpler version of the app called Focus Go. It's a quick way to review images without unnecessary features getting in your way. Focus Go is very stripped down, but that might appeal to some people. There's no folder structure or restricted directories. All the images on your device are shown in the main interface. 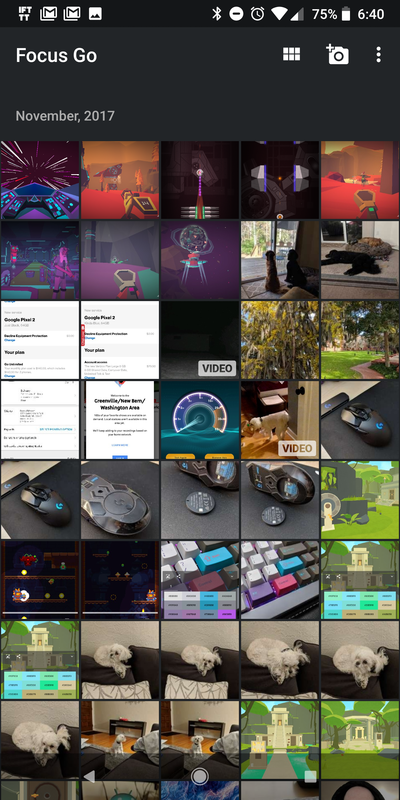 It's just wall-to-wall photo thumbnails, but you can tap the grid button at the top to change the size of the thumbnails. The default setting is in the middle, so there's a more compact option and one with larger thumbnails. Also at the top of the app is a camera shortcut button. The image list is chronological and separated by month. Since it shows all the images on your device (photos, screenshots, etc. ), it can get quite long. If you scroll down from the top, the action bar falls off the screen, and it's literally all photos. It's a neat look, actually. Of course, you can tap on any image to expand it in full-screen mode. In full-screen mode, you can zoom in for a better look at the photo. At the bottom of the screen are a few buttons. You can delete photos, share, set as wallpaper, and there's even integration with the Graphice app I covered recently (it's the same developer). I also like the info button, which pulls up EXIF data for the image in a small popup that doesn't take focus away from the photo. Focus Go is really a hint of what we can expect from the upcoming full rewrite of the Focus app. That complete gallery replacement has been lagging for a while, but it's going to be much more modern very soon. In the meantime, Focus Go is good for taking a quick peek at your pics. Another week is upon us, and that means it's time to check out the state of the Google Play Store. Your phone is only a shadow of itself without the best apps, so it's a good thing we're here to save the day. Just click on the app name to pull up the Google Play Store so you can try things out for yourself. What color is that in your photo? It can be hard to say, what with the variance in display calibration and our own woefully inaccurate eyeballs. Graphice is a new app in the Play Store that can tell you, objectively, what colors are in a photo. It's free to try, but there's also a paid upgrade with more features. Graphice looks and works a bit like your standard gallery app. Open it up, and you see all the images on your device. 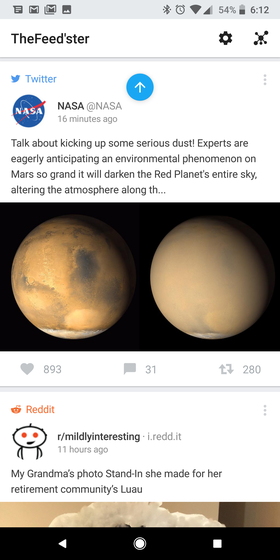 You can tap on any of the thumbnails to open in full-screen. At the bottom of the screen is a toolbar, which expands with a tap. It opens a full palette of colors from your image. Each one has a swatch and the hex value of the color. A long-press on any square copies the hex value, which you can then paste into other apps. As an aside, Google search understands hex values, so you can get more info on the color. The toolbar also includes a share button, but this isn't just a regular photo sharing feature. This button brings up the image along with your color palette. You can tap on as many hex values as you like, which are then included at the bottom of the image. This new JPEG is what's shared via Graphice. You can send it to any of the apps on your phone that plug into Android's share menu. So, that's neat, and it's all free. If you pay for the $2.49 pro license, the app gets substantially more useful. With the upgrade, you can specify areas of your photo to generate multiple palettes. 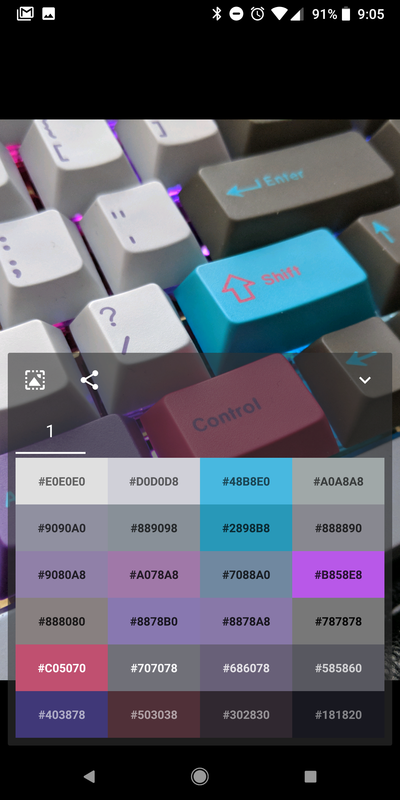 These are all saved in the app, and you can do the same things with those palettes (eg. sharing and copying hex codes). The multi-palette options are grayed out if you don't pay the license fee. Graphice seems like a solid way to obsess about colors. The free version will be fun to play around with if you're not super-serious about design. There are no ads, either. Google announced a new budget phone initiative at I/O last year called Android Go. The "Go" build of Android is intended to run on lower-specced devices and will include a special suite of Google apps. One such app is apparently the newly launched Files Go. 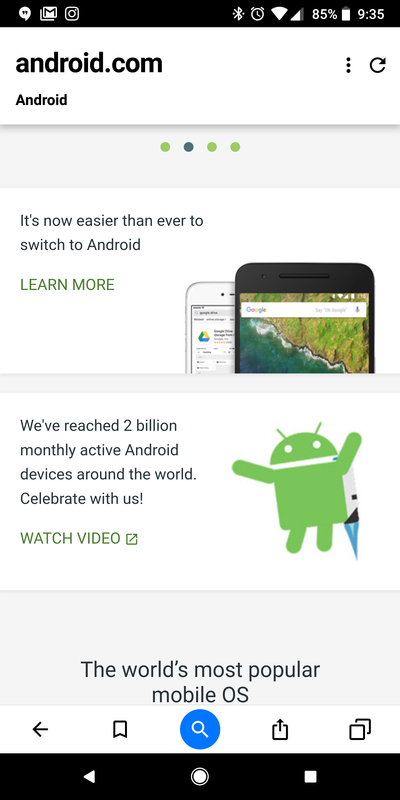 This app showed up in the Play Store recently, and Google has now opened it up to almost all devices. It's not a full file manager, but it includes several features that could help keep your device storage tidy. When the eventual Android Go phones launch, they will have a limited amount of internal storage. Thus, many of the features of Files Go have to do with clearing out old files that you no longer need. Even if your phone has plenty of internal storage, you may eventually run low. Files Go is a fine way to clear space on any phone. Upon opening the app, you are greeted with a number of suggested actions in a vertically scrollable list. They're all based on the actual files on your device, not just general actions. For example, you might have a card that suggests you clear temporary files from your app cache to save a certain amount of space. On my phone, that's 500MB. The app also detects duplicate files on your internal storage, allowing you to delete one of the copies. If you grant usage access in the system settings, Files Go can also alert you to unused apps that you can safely remove from your phone. That's all in the Storage tab, but moving over to the files tab reveals an entirely new set of features. You can tap on the various file type options to see a list of all matching files on your device. Again, this isn't a full file manager, but it offers essential tools to find out what's on your phone. There's also a built-in option to send files to other nearby devices with Files Go without using the internet. It uses Bluetooth, so it's not going to be fast. It's obviously more geared toward usage in places where mobile data is scarce or expensive, but you can use it simply as a convenience. This app is still in beta, so Google is liable to add features and improve the ones that are already there. If this is indicative of what we can expect from the other Android Go apps, it'll be a fascinating platform to watch. 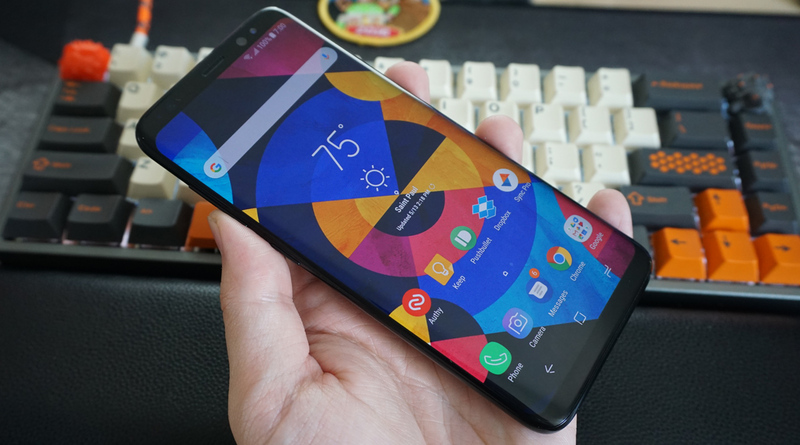 There have been a ton of phone releases in the last few weeks, so it's even harder than usual to figure out which phone is the best purchase. While LG's phones have been getting better, Samsung is reaching new heights with the Note 8. Meanwhile, OnePlus has something big planned for the near future, and Google has encountered some push-back with its Pixel 2 launch. What's an Android fan to do? If you want to get a phone directly from your carrier, the latest offerings from Samsung are the way to go. If you don't want to spend as much, there are a lot of extremely compelling deals on the Galaxy S8 and S8 Plus. If price is no object, the Galaxy Note 8 is an even better phone. The Galaxy S8 has a 5.8-inch curved display, whereas the Plus has a 6.2-inch curved panel. They both have a resolution of 1440 x 2960 pixels, among the highest you can get on a smartphone. Despite the large screen sizes, the tall aspect ratio and small bezels make the phones easy to hold. They have an even higher screen-to-body ratio than the iPhone X. Samsung's AMOLED displays are still the best you can get with incredibly high brightness and (optional) accurate colors. This phone is very comfortable to use with the symmetrically curved front and back glass— there's nothing pointy or angular on the phone. Although, the curved glass is vulnerable to breakage when dropped. Broken Galaxy S8s are apparently common, and the glass back is very slippery. The Galaxy S8 was the first Samsung phone to move to on-screen navigation buttons. Thankfully, there's an option in the settings to change the order of buttons to the "correct" one used on most other phones. The home button is also accessible at any time thanks to a pressure-sensitive region on the screen. Even when the phone is asleep, simply pressing harder will trigger the home button—this is a great feature. I really like this feature, and I find myself missing it when I use a different phone. Android's notification system is usually a joy to use, but there's no way to recall notifications after they've been dismissed. Sometimes you regret swiping something away, but the system logs only basic information about the notification, and you can't even access that very easily. Notification History makes your past notifications more accessible and actionable, and you can give it a shot for free. This app requires just a little setup, but it's easier to get running than I expected. After opening, you have buttons at the bottom for the "advanced history" and "notification history." The notification history option isn't technically part of the app—it's just a link to the hidden settings menu in Android that logs the basic data from all your notifications. It's not very useful for actually doing anything with your old notifications, but you can see what apps have produced notifications and when. For the Advanced option, you'll have to grant the app access to your notifications. 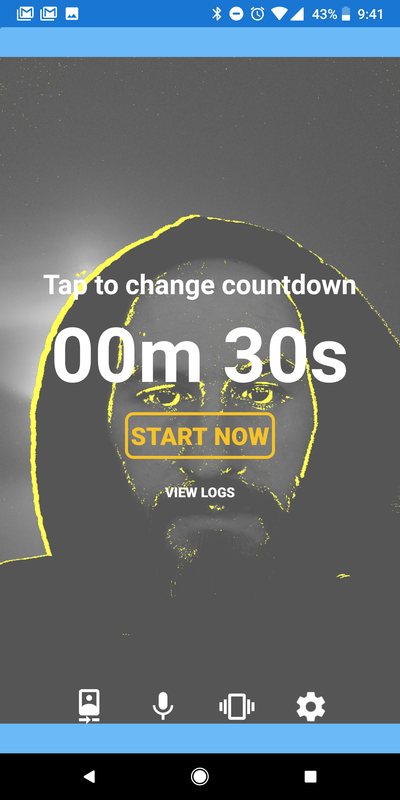 After that's done, the app will continuously log all the notifications that pop up on your phone. Since it's connected to the system-level feature, Notification History doesn't need to run a service of its own or a persistent notification to stay alive. Simply open the advanced history to see your notifications organized from most recent to oldest. It logs all the notifications too. That means even something like the Google Camera app that pops up a temporary notification when it's processing a photo will be included in the list. You can tap on any notification to open the app, pull up the app info, or open the Play Store page. If you want to clear the clutter a bit, the pro upgrade is going to appeal to you. 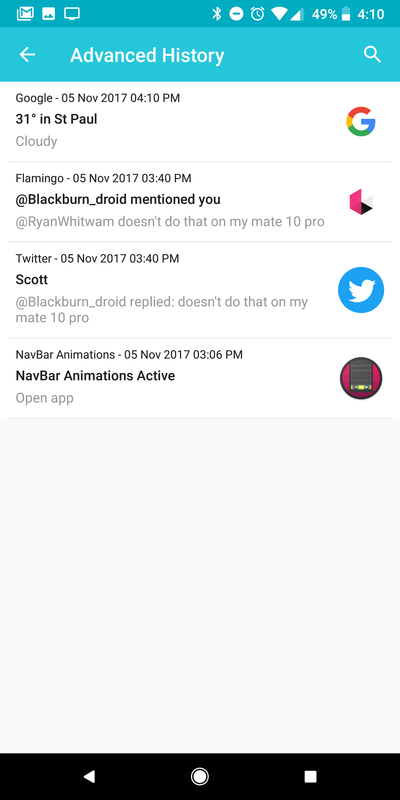 For $1.49, the advanced history menu lets you swipe to remove notifications, blacklist apps from appearing, and removes all the ads in the app. It seems like a good deal. Well, your phone or tablet might be cool, but it could be a lot cooler with the right apps. So what? Spend like mad until you find the apps that suit your needs? Nah, just read the weekly Google Play App Roundup here on Tested. We strive to bring you the best new and newly updated apps on Android. Just click the app name to head to the Play Store. 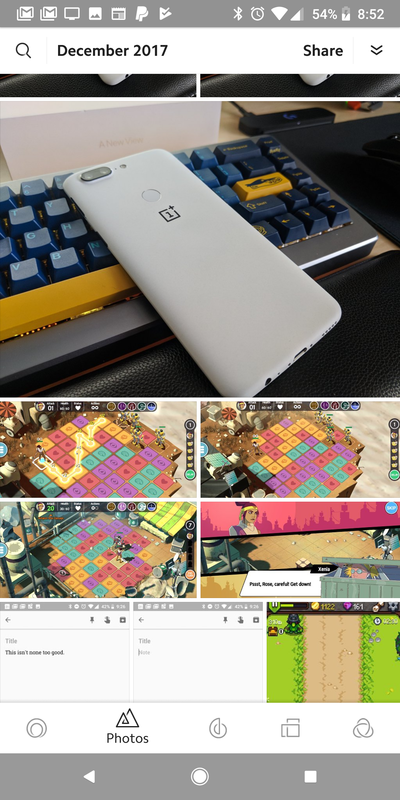 Some Android phones come with a built-in mode for one-handed use. These features vary a bit in implementation, but they all aim to make it easier to use the phone by shrinking the UI down to a smaller part of the screen. The new One-Handed Mode app lets you do this on any phone or tablet, but it comes with a bit more setup than most apps. One-Handed Mode takes advantage of a permission called "Write Secure Settings" that is usually only granted to system apps. If you're rooted, the app can be enabled automatically by granting it root access. For non-rooted devices, you'll have to plug the phone into your computer to enable the permission. The developers link to instructions for this, but it's only a single command in ADB. If you already have the Android SDK tools on your computer, it takes about 10 seconds. With One-Handed Mode turned on, The screen shifts downward to place everything in reach of your thumb. The top section of screen is just filled with a solid block of color based on the app you're using. Some apps won't tolerate this change very well, but most of the apps I've tried behaved fine. The home screen is probably going to do some strange things due to the DPI scaling, though. In the settings, you can adjust the size of the screen when the app is active. The default layout still spans the entire width of the screen, so you might want to adjust that to "justify" the screen to one corner or the other. You can also turn off DPI scaling if that's causing issues with an app you want to use with One-Handed Mode. One-Handed Mode can be turned on by opening the app, but there's also a floating toggle. The toggle is only available with an in-app purchase of $0.99, though. If you're not turning one-handed mode on and off all the time, the toggle isn't strictly necessary. Let's face it, the app is a bit of a hack, but it works well enough to drop a buck on. We care about your phone almost as much as you do, so we're here every week with more apps and games to make it better. This is the Google Play App Roundup, which is where we tell you about all the best new stuff on Android. Just click the links to head right to Google Play. There are various third-party Android launchers than can make your device more configurable and "Pixel-y." The most popular options are Action Launcher and Nova Launcher, but those both have paid upgrades that are needed to unlock all the features. The new Lawnchair Launcher doesn't have quite the same feature set, but it's respectable and costs nothing. 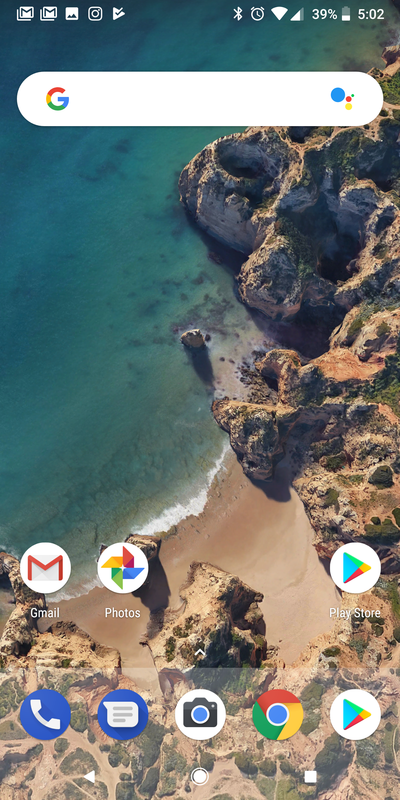 After installing Lawnchair Launcher, you'll get a home screen that looks a whole lot like the Pixel Launcher. That's possible with other launchers, but you need to do some configuration. This is already done for you with Lawnchair. The app drawer is accessed via a swipe-up, there are launcher shortcuts, and you can even get the Google Feed on the left of your main panel. Note: that requires you install a separate app from the launcher developer, which isn't listed in the Play Store. It's the same setup Nova and Action Launcher use. Lawnchair Launcher includes plenty of tweaks for your icons, which is table stakes for Android launchers these days. You can toggle labels, change the size, and apply an icon pack in the settings. You can also add a dedicated Assistant button to the search bar, which is neat. Don't want the search bar? You can just get rid of it. There are also some ways to adjust the dock, but it mostly stick to Pixel styling. You get some basic theme settings in Lawnchair Launcher, but this is one of the weaker aspects of the app compared to more mature options—just light, dark, and black themes. However, you can pick and choose which parts of the launcher get the theme applied. So, you can get the handsome dark search bar without making the rest of the UI dark-themed. There's not a ton of custom stuff running behind the scenes of Lawnchair Launcher, so there's not much opportunity for things to get janky and buggy. It's a mostly stock launcher, and it runs like one. That is to say, performance is great. Sometimes I forget I'm not using the real Pixel Launcher. There's just enough customization that it'll satiate a good number of Android users, and it's free. Grab your phone and prepare to shoot some new apps and games over to it from the Google cloud. It's time for the Google Play App Roundup where we tell you what's new and cool in the Play Store. Just click the links to head to each app's page to check it out for yourself. Internet Explorer was a staple of Microsoft Software for many years, but it was replaced by Edge with the release of Windows 10. With Microsoft focusing on other mobile platforms so much, it was only a matter of time until Edge branched out from the desktop, and now is that time. Edge is currently rolling out for iOS and Android, but these two versions are slightly different. On Android, Edge is based on the Chromium project, which itself serves as the base for Google's Chrome. On the desktop, Microsoft has its own EdgeHTML engine, but that's not designed to operate on Android. The iOS version, meanwhile, uses Apple's WebKit engine as required by Apple's developer guidelines. Chromium is open source, so Microsoft has been able to make ample changes to the way it looks and works. However, some of the basics are the same. Upon opening Edge, you get a search/URL bar at the top of the screen and some frequently accessed sites right below that. Scroll down further, and you have a feed of top news stories. This is similar to Chrome, but it's all tied to your Microsoft account. You don't have to sign in with a Microsoft account to use Edge, but it adds to the experience. Down at the bottom of the screen is a "continue on PC" button. That sends your current page from the phone to one of your synced devices. However, this feature requires the new Fall Creators update on desktop, which is still rolling out. Your bookmarks, history, and reading list also sync across devices in Edge. Pages load quickly in Edge, and it keeps multiple tabs in memory well. The navigation buttons at the bottom of the screen allow for quick access even on large devices. Speaking of larger devices, there's a dedicated tablet UI that moves some of the controls up to the top more like a traditional browser. If you want to access a site without saving it in your account, there's built-in private browsing mode, too. 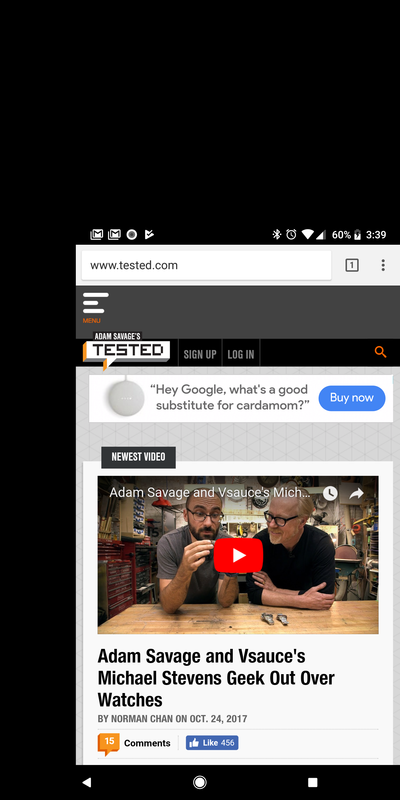 Edge is still in beta, but it's a perfectly capable browser. If you're deeply tied into the Microsoft ecosystem, it's something to check out. It's time again for us to dive into the Google Play Store and see what treasures we can dredge up. The Google Play App Roundup brings you the best new and newly updated Android apps and games each week. Just click on the links to head right to the Play Store. When gave up on keeping its software and services exclusive to Windows Phone some years ago. It even started an incubator called Microsoft Garage to come up with new apps for iOS and Android. One of the products that came out of the Garage was Arrow Launcher for Android. Now, this alternative home screen has graduated to being a full-fledged Microsoft product called Microsoft Launcher. It's not just a name change—the new update includes new features, a new look, and more. It should come as no surprise, but Microsoft Launcher works best if you log in with a Microsoft account. That's technically optional, but many of the included widgets and features will be inert without that connection. There's also a folder of Microsoft apps on the home screen, even if you don't have them installed. In that case, they're links to download the apps. Getting started with Microsoft Launcher is quick, and users of Arrow Launcher will notice many of the old features have remained in the new version. There's nothing particularly wacky about Microsoft's approach to the Android home screen. You can place apps and widgets on the home panels wherever you like, add new panels, and your apps are accessible in a vertically scrollable app drawer. There's a search bar at the top of the screen that, no surprise, goes to Bing. I also like the nifty swipe up system info bar at the bottom of the screen. To the left of the main home screen panel is Microsoft's customizable feed. Several of the included widgets here won't do anything without a Microsoft account login, so feel free to remove them. If you do log in, you get things like weather and integration with news. The feed also has widgets for your calendar, recent contacts, recent apps, and recent actions (photos, app installs, and so on). You do have to grant a lot of permissions for all these features to work, so that's up to you. However, using Microsoft's included widgets makes the themes look very nice. You can pick from several styles and accent colors to make the home screen and feed look just how you want. Microsoft Launcher is free, and there are no in-app upgrades. It should come through as a regular update to Arrow Launcher, but you can install the new version directly by joining Microsoft's testing group in the Play Store. Whether you're troubleshooting a problem or just showing off, there are times you want to know exactly how fast your phone's data connection is. There are a number of tools for finding that out, but few of them are as clean and easy to use as Network Speed. 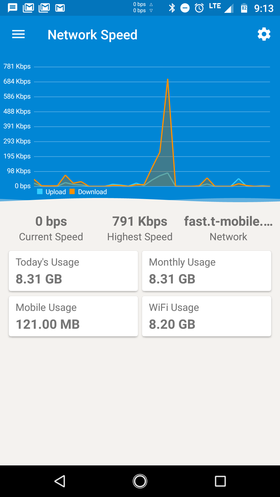 This app not only tracks data speeds across your phone, it offers a cool floating widget so you can obsess over data speeds non-stop. This app needs usage access in order to track data usage across your device, but there's nothing unexpected about that. Grant the requested permissions and Network Speed will start tracking your up/down speeds and logging your bytes. It doesn't tell you which apps and services are using the data, but you get a breakdown of when data usage is happening. The main screen has a chart that shows your speed history over the last few minutes. There's also a listing for your current speed, fastest speed, and network type. Below that are counters for how much data you've used in various intervals of time. Tapping on any of them opens the detailed view, which breaks down your data usage by day. 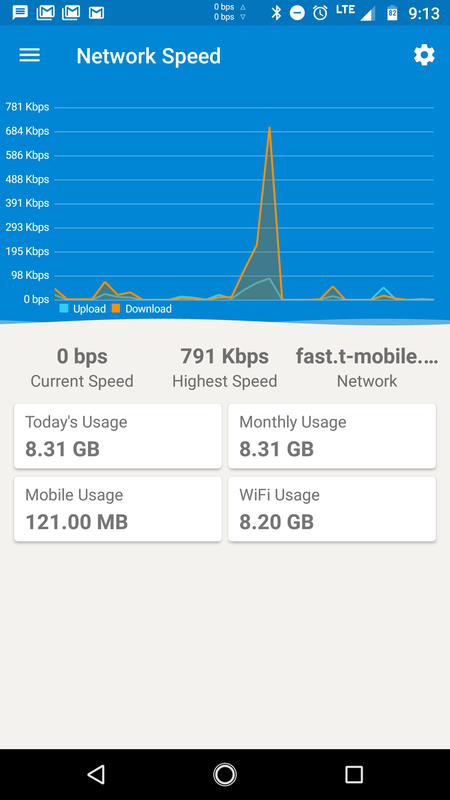 You can use Network Speed to alert you to high data usage if you don't like the built-in Android tools as well. My favorite part of the app is the floating data monitor widget. This display updates as often as you like (the default 1 second update is too fast) with up and down speeds. It appears up in the status bar, but you can move it elsewhere. In the middle of the status bar, it's mostly out of the way of other things, though. Several different looks and layout settings for the widget are available in the settings. It can also be configured to hide automatically in full-screen mode. Network Speed uses a persistent notification to stay alive. By default, it has a status bar icon with your speed. If you want to use the much better widget, this is rather redundant. You can set the notification to low-priority instead, and it will be collapsed at the bottom of the shade. That should be good enough for most users. Network Speed is free to use with ads, but a $0.99 gets rid of them. We're really getting spoiled these days. Great Android apps are coming out all the time, but it can still be hard to find them amid all the clutter. The Google Play App Roundup is all about clearing the junk out of the way so you can find the best apps. Just click on the app name to go straight to the Google Play Store and pick up the app yourself. Sometimes it can seem like you only get calls and text messages when you can't pick up the phone. There's nothing to indicate to the person on the other end of the line what you're up to or why you can't answer the phone. That's where Can't Talk comes into play. This app runs in the background to automatically fire off a custom reply when you get a call or message. Setting up Can't Talk can be a little intimidating because it does need a lot of access to your data. It can't work without plugging into the notification listener, but it links you to the right menu to grant that. You also have to allow permissions for calls, contacts, and messaging if you want all the features. None of this feels like overstepping, considering what the app does. The functionality is split up into three groups for calls, SMS, and app messages. For calls and SMS, the app sends an SMS reply when active. In both cases, you can choose which contacts get auto-replies from Can't Talk. There's also a "rate limiter" option that controls how often replies will be sent to the same contact, which is a thoughtful bonus. The app reply functionality is my favorite aspect of the app as most of my contacts have moved away from calls and traditional SMS. To get this working, you simply need to tell Can't Talk which apps you want it to reply to. Anything that uses standard Android notifications for messages should work, so Hangouts, Facebook, and more are supported. When Can't Talk is running in the background, there's an ongoing notification to make sure you're aware. I'm not usually a fan of this behavior from a UX perspective, but it's necessary to keep apps from being killed by the system. And in this case, it makes a lot of sense. You don't want to accidentally leave your auto-responder running when you're no longer unavailable. The notification has a handy "disable" button so you can turn Can't Reply off. To get rid of the notification, just turn the main toggle in the app to the "off" position. Can't Talk is completely free in the Play Store. It's technically in beta right now, so maybe it'll get in in-app upgrades at a later date. For now, there's no reason not to give it a shot.